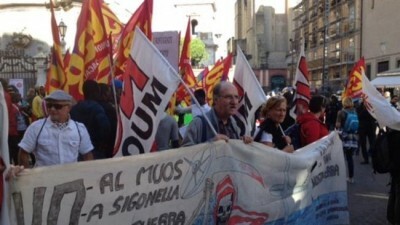 Thousands of anti-war protesters in Italy and Spain have taken to streets to express opposition to war games conducted in their respective countries by the US-led NATO military alliance. The demonstrators carried banners and chanted anti-NATO and anti-US slogans during their protest in the southern Italian city of Naples and Spain’s capital Madrid, insisting that the aim of ongoing military drills – dubbed ‘Trident Juncture 2015’ — is to prepare for new aggression on the horizon. According to press reports, the North Atlantic Treaty Organization embarked on a major military exercise on September 28 in bases in Spain, southern Italy, as well as Portugal involving 36,000 air, land, and marine troops from over 40 countries and organizations. The war games – the NATO’s largest in the past 13 years — is set to continue until November 6. Meanwhile, the protesters in Madrid marched through the center of the city to censure the massive military drills that are currently underway in Italy, Spain, Portugal, the Mediterranean Sea and the Atlantic Ocean. The anti-NATO protest efforts come as the military alliance has drastically expanded its war games in eastern European countries neighboring Russia, in what Moscow has censured as provocations over the persisting Ukraine conflict in a bid to expand military presence near Russia.